I was delighted to be a Regional Finalist in the 2019 Wedding Industry Awards and a Gold Certificate of Excellence from Bridebook after just my second season as a Wedding Celebrant. Having trained with the Fellowship of Professional Celebrants in April 2017, I have managed to build a reputation of working closely with couples in the lead up to their wedding. I provide a fully handwritten, unique and bespoke ceremony every time. The training I received has inspired me to be the best I can be and make inroads into the Southern Spain wedding professional circuit, something which initially seemed impossible. I was delighted to have my hard work and passion recognised by the Awards which were entirely voted for by my couples. I am privileged to work with couples from all over Europe in some magnificent destinations. From villas to beaches, hotels to palaces. Covering an area from Sotogrande in the west through to Mojacar in the east including Seville, Ronda, Granada and even Barcelona. 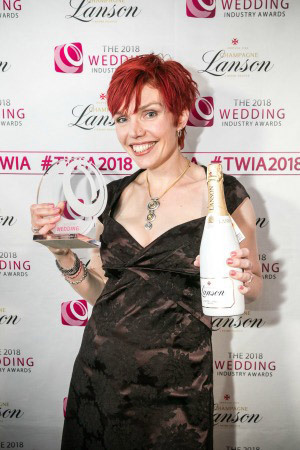 Regional Winner ‘Wedding Celebrant of the Year’ (TWIA) in 2018. 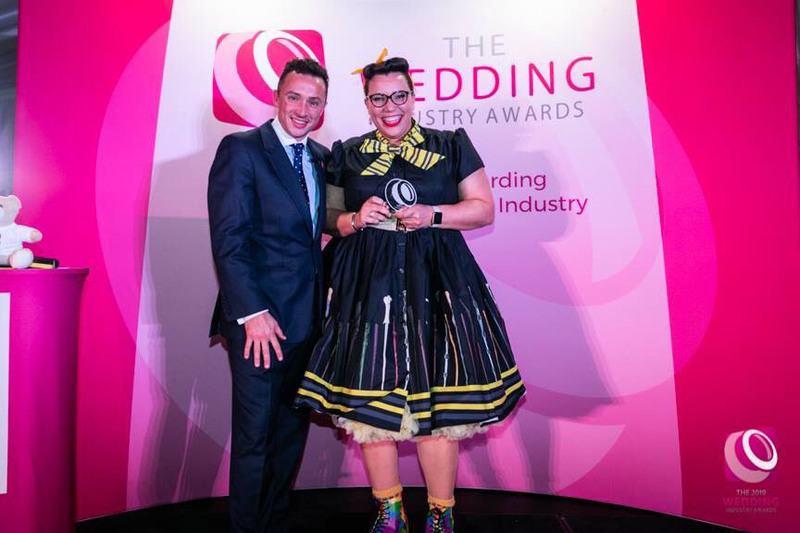 Regional AND National Winner ‘Wedding Celebrant of the year’ in 2019. Just after I’d first trained as a wedding celebrant with the FPC, I was chatting with a friend of mine who is a wedding photographer. She told me about the entry she was working on for The Wedding Industry Awards. She added that it would be a good thing for me to go for the following year. Having only just qualified, I laughed and said there would surely be no way that would work. But my friend said that TWIA was unusual because it is the only awards that operated on a truly level playing field. So it doesn’t matter whether you’ve done 5 weddings or 500 because of the fair way that it’s judged. What's more the only people who can vote for you are couples whose wedding you have worked on the previous year (no having to canvas for votes all over social media like many of the other awards). Fast forward a year, and I decided to take the plunge. TWIA didn’t have a category for celebrants then, so I entered the ‘Special Touch’ award, which is basically everything they didn’t have a category for. The entry was a little complicated. It involved asking all the couples I’d worked with if they would vote. I also had to give them the right link to go to, curate photos and videos that showed me at my best, and answer a detailed set of questions. All of these are seen by an independent panel of judges. It was amazing to be shortlisted (for both ‘Special Touch’ and ‘Newcomer’) and I went to regional awards full of excitement. I didn’t win that year. But the evening was wonderful. It was full of industry lovelies to network with, some I knew and some I didn’t, and with a buzzy party atmosphere. I was hooked. Even more so when TWIA sent us the voter feedback afterwards. Cue lots of tissues for happy tears! At the awards ceremony that year, I’d asked Damian, the TWIA founder, if he would consider a celebrants category for future years. (I say ‘ask’, actually I’m afraid I rather corralled him and then enthused at him for about 10 minutes about celebrants and how well it would work. I blame the prosecco!) The following year, there was a celebrants category! Hooray! I entered again, and entreated my fellow celebrants to do so to. This was only good news for our growing profession’s visibility. I pored over the entry again. This was much more focussed now on celebrants of course, entreated my awesome couples to vote for me. So I sat back with my fingers firmly crossed. I was shortlisted for the regional finals again, this time along with 3 other celebrants. 2 of these I knew well and who had been super supportive and helpful. I was genuinely shocked when I won ‘Celebrant of the Year 2018 South East.’ Furthermore I was genuinely touched by the huge amount of support and joy that came from the rest of the room, including and especially my celebrant colleague and friend who was there with me. Damian whispered to me on stage as I was receiving the award ‘it was worth badgering me about the new category then!’ That was in the November and I rode high on the adrenalin of the win over Christmas. It wasn’t long until January rolled around and the National Finals took place. I met up with most of the other celebrant of the year winners from the other regions, along with other celebrant folk who happened to be in the area, for a pizza and some drinks before the big awards ceremony. This took place in Café de Paris in London. It got loud and raucous quite quickly!! Firm friends by now, we all sat together around a table at the awards ceremony, drinking in the fabulous atmosphere and the anticipation. It seemed that Damian announced the winners of just about every category, but then our category was introduced and our excitement levels went nuclear. I still can’t quite remember what happened next without thinking it was a dream! Damian called my name and I floated up to the stage on a cloud of happiness and disbelief. After some photos and a filmed interview backstage (in which, shellshocked, I managed to say the word ‘brilliant’ a world record number of times…) I returned to my celebratory celebrant friends and we partied the rest of the night away together. What. A. Rush. But, having spent so much time telling you about the experience of winning the award, actually what it meant was so much more than that. It meant so much that after (at the time) just over two years of doing this job that I love, I could win a national award. I put this down to not only having found the thing that I genuinely think I was put on this earth to do, but also my fantastic training from the FPC which set me up to do it. It meant that the couples I’d worked with had been as happy about their wedding ceremony as I’d been happy to do it. It meant that celebrants everywhere were starting to get noticed and our work was being valued. 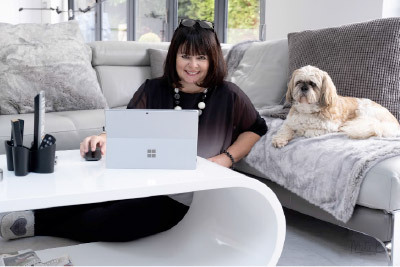 We had a category now, and noticeably fewer people were asking ‘what’s a celebrant?’ It meant that I saw what a wonderfully supportive bunch other celebrants – and the wider wedding industry – can be. And it also meant that some amazing opportunities that I never could have predicted would come my way. I saw an increase in bookings, with couples reassured they were making the right choice as I had won the award. I was asked to deliver training for the FPC and also conducted a wedding live on ‘This Morning’ from the Royal Albert Hall. Both of these things have been fantastic and both came about directly because of the award. 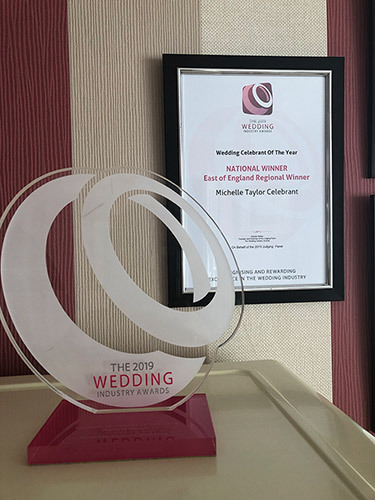 I’m really chuffed that winning this award not only benefitted me personally and my business, but that the role of celebrants in a wedding is now being properly recognised by the industry. Also that the things winning has led to for me enables me to further promote our wonderful work. This includes training others so they can start their own celebrant career, and bringing what we do to a wider audience on daytime TV. I really believe that a win for any celebrant is a win for our profession as a whole. 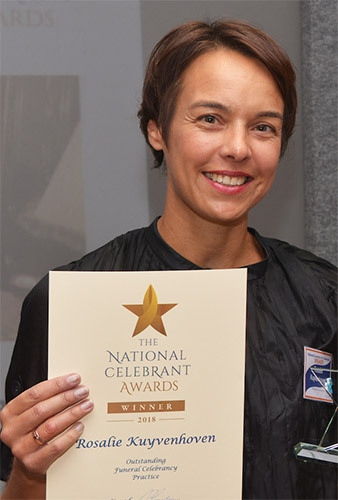 And I’m honoured to have won the first National Celebrant of the Year Award for both my business, Creating Ceremony, and as a representative of the FPC. 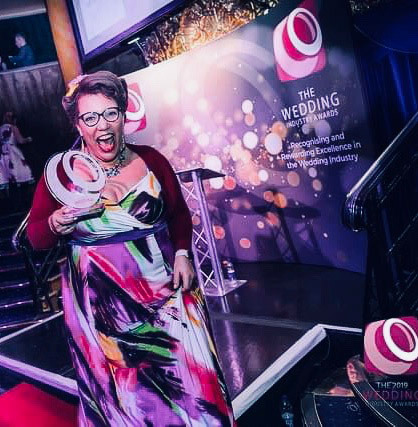 So if you’re a celebrant and you’re wondering about whether to enter an award – big or small – my answer would be (as I’m sure you can guess by now) a resounding YES! Go celebrants! Give talks on the future of funerals and ceremony design. 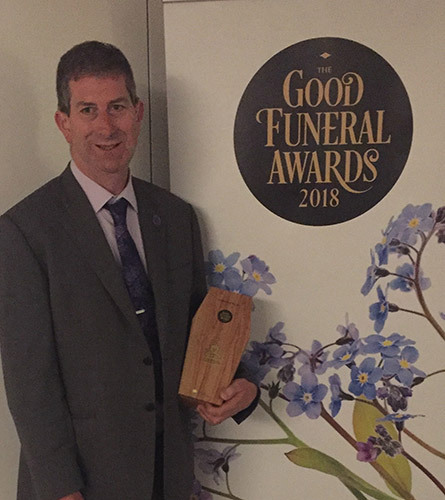 I was thrilled to be named the Good Funeral Award Celebrant of The Year 2018 last September. Having been shortlisted alongside those Celebrants who I would considered more experienced, I was totally humbled and honoured to win the award. Despite me winning, I felt I represented a group of brilliant people who provide a unique service to celebrate the lives of unique people. Together, and alongside other Funeral Professionals we are all working to show the ultimate respect to those who have died. It means so much to have been nominated in the first place. Added to the endorsement by the judges, the kindness and respect shown from colleagues within the funeral service (who said such kind things when they knew I had been nominated), as well as my partner and friends has been amazing. I would not be where I am without the initial training and belief from Terri Shanks. Back in 2014 I was a very nervous newbie who entered the room and participated in the Funeral Celebrancy course. My respect and thanks to all at The Fellowship of Professional Celebrants and other Celebrants for their ongoing support. My Background My background is Nursing and Social Work but I had always had an interest in bereavement since my mother died in the 80s. I later trained as a Funeral Director. When I found Celebrancy, all the skills, knowledge and experience I had gained along the way fell into one place. I am passionate about and love my role which I have been doing full time since April 2017. Being entrusted to support families when they are most vulnerable is a responsibility I don't take lightly. Meeting families for the first time is a pleasure. I love listening to their stories and have learned so much about the rich lives their loved ones have experienced. I have understood far more about real social history which taps into my love of history at school. My Work Then comes the creative part. Sitting in front of a blank computer screen to put a persons life into a narrative excites me. That creativity comes in all different shapes and forms from working with a theme. Like linking Abba hits to different parts of the persons life. Or taking the congregation on an imaginary road trip to the places the person had been. Each ceremony must reflect the person and the biggest compliment (more than the award) is being asked 'How long have you known them?' as people leave. Yes as a human being, I have made mistakes (like saying mammories instead of memories at a funeral.) I felt the blush from head to toes! But I always learn and hope I show ultimate respect for the Deceased person and their families. The funeral itself is team work. Every funeral is different and being able to work alongside different Funeral Directors, teams and different crematoria staff is essential. Together we create a funeral as if it the only one happening. My motivation is and will always be to serve the memory of those who have died and those they leave behind. The Good Funeral Award received will always be treasured alongside the experiences and learning gained from Funeral Celebrancy. This is a service I am thrilled to be associated with. So I look forward to continuing on this journey. For Further Information, visit: www.davidmilesuk.com.